On 2 February 1907, A.P. Branch agreed to advance John Artis, colored, forty to fifty dollars in supplies “to enable me to make a crop” on the land on which he lived in Black Creek township rented from and owned by Nathan Bass. 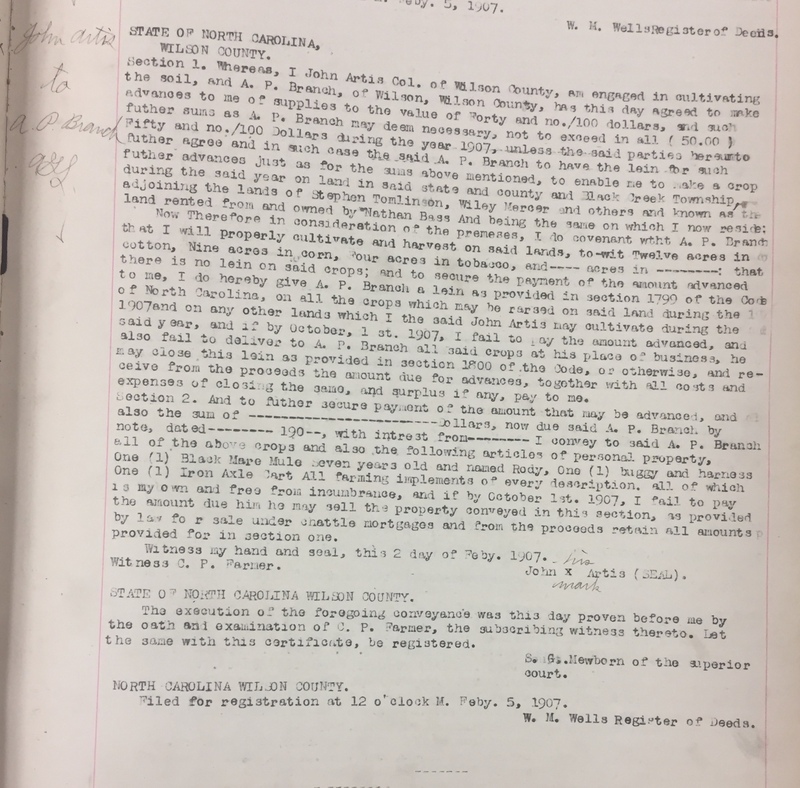 Artis agreed to raise twelve acres in cotton, nine acre in corn and four acres in tobacco and gave Branch a lien on his crop as well as a seven year-old black mare mule named Rody, a buggy and harness, an iron axle cart, and all his farming implements. In the 1910 census of Black Creek township, Wilson County: farmer John Artis; wife Lucy, 40; children Nora, 10, John E., 15, Eliza, 13, Katie, 11, and Robert, 7; and nephew Luther, 23. Deed book 72, page 191, Register of Deeds Office, Wilson. ← Littleton Ellis’ land division.